By Clemente Lisi – NEW YORK, NY (Apr 1, 2019) US Soccer Players – A few surprises stand out when you look at the quarterfinal matchups of the UEFA Champions League. No Real Madrid, winners of the last three editions. No Bayern Munich, the perennial German powerhouse. No PSG, whose oodles of money hasn’t been enough to move the needle much in this competition in recent years. The teams that are there, however, also tell a story. The one that stands out is Ajax. The Dutch club has not competed for European honors at the same clip it once did in the 1970s and again in the mid-90s. Still, it has consistently produced elite talent. Name an outstanding Dutch player and you get an Ajax connection. Superstars from the 1980s, like midfielder Frank Rijkaard and striker Marco van Basten and to recent ones such as strikers Patrick Kluivert and Wesley Sneijder, either came out of the club’s youth academy or got their careers started on the first team. Ajax also gave the game the style of play known as Total Football. The trademark style of the Dutch National Team throughout the ‘70s, this method of approaching the game began at Ajax. The origin dates to well before the glory era of the 70s. English-born manager Jack Reynolds introduced the concept, coaching Ajax three separate times (1915–1925, 1928–1940, and 1945–1947). While other teams experimented with it, most notably Hungary in the 1930s and ‘50s, Total Football as we know it today was born when Rinus Michels, who had played under Reynolds, became Ajax coach in 1965. Michels reworked the concept with help from Cruyff. While the lean striker technically played as a center forward, Michels encouraged Cryuff to freely roam about the field. Using both his technical abilities and instincts to exploit any potential weaknesses, defenders found Cruyff nearly impossible to mark. The aim was to break down an opponent and help his side create scoring chances. At the same time, Cruyff’s teammates also adapted and switched up their roles on the field. The spatial awareness exhibited by Ajax in those years was exceptional. The club became one of the most successful in the world, cementing its legacy as a developer of talent. Like a well-run orchestra, the players interchanged roles. It was largely a success as the National Team reached the World Cup final twice during that decade, in 1974 and ’78, only to lose them both. In that era, Ajax put together a perfect home record of 46-0 during the 1971–72 and 1972–73 seasons. They won four championships in 1972 alone, the Eredivisie title, KNVB Cup, European Cup, and Intercontinental Cup. Michels and Cryuff would also become ambassadors for the sport, reuniting in the NASL with the Los Angeles Aztecs in 1979. Using a 4-3-3 formation at Ajax, Michels and Cruyff would go on to capture eight league titles, three European Cups, and one InterContinental Cup. The tactic was a triumph against anti-soccer – most notably the catencaccio made popular by coach Helenio Herrera at Inter Milan and later by Italy’s National Team – although it didn’t survive for long. Michels did coach Holland to the 1988 European Championship, a team spearheaded by van Basten and his AC Milan teammates Rijkaard and Ruud Gullit, but Total Football had largely disappeared by then. Cruyff brought a version of Total Football to Barcelona in the ‘90s while Ajax had a successful run under Louis van Gaal including winning the 1994-95 Champions League. Van Gaal's style of play wasn't total football, with the Dutch game evolving along with the rest of the world's. Van Gaal would move to Barcelona in 1997, eventually leading the Dutch National Team to the 3rd-place in the 2014 World Cup. While Ajax has continued to develop players, serving as a feeder system for Europe’s biggest clubs, the Dutch side has come into its own this season. The team is currently second in the Eredevisie, vying for the title against PSV Eindhoven. In the Champions League, the team has reached the quarterfinals, the only team left in the tournament that started out in last summer’s qualifying rounds. Their 5-2 aggregate win against holders Real Madrid remains one of this season’s biggest upsets. Ajax will try to replicate those heroics against Juventus when the sides meet for their first-leg encounter on April 10 in Amsterdam. The clubs have a history. Ajax lost to them in the 1996 Champions League final. This season, Erik Ten Hag has emerged as one of Europe’s best coaches. A former center-back, Ten Hag is trying to restore some of Ajax’s former glory. He’s abandoned the team’s traditional 4-3-3 setup for a 4-2-3-1, but that freedom of movement is still there. It may not be pure Total Football, but Ajax likes to use the wings and also flood the middle of the field depending on the situation. Players like midfielders Hakim Ziyech and Dusan Tadic cover lots of ground. When not on the wings, this duo will move into the box and even as far back as the center circle to support the run of play. That flexibility harkens back to Total Football. While still largely underrated, both Ziyech and Tadic have emerged as two of Europe’s most-exciting players. Tadic, who joined Ajax this season after struggling for four years at Premier League side Southampton, has taken to Ten Hag’s system. 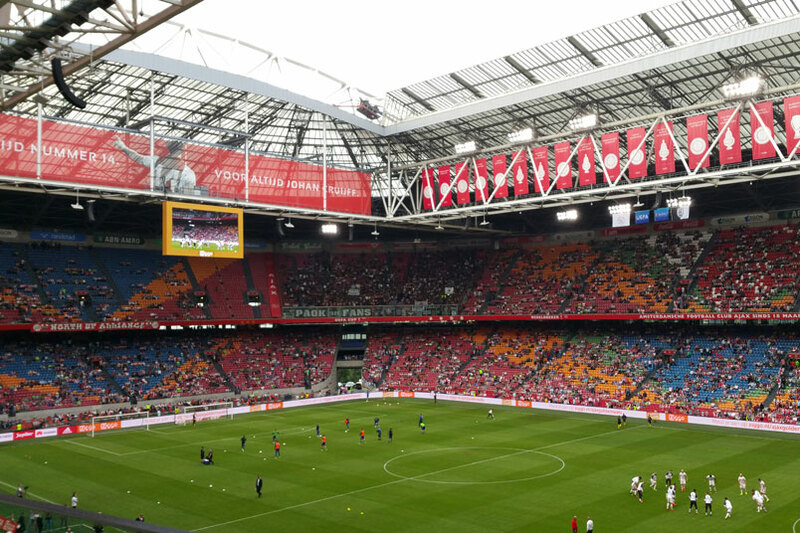 While Total Football may not be back entirely, Ajax certainly is at least for this season. With Barcelona already buying Frenkie de Jong and strongly linked with Matthijs de Ligt, there's no chance Ajax keeps this squad together. That means the time is now for the famed Dutch club with a storied past.